Re:Imagining Change is an inspirational inside look at the trailblazing methodology developed by the Center for Story-based Strategy over fifteen years of their movement building partnerships. This practitioner’s guide is an impassioned call to innovate our strategies for confronting the escalating social and ecological crises of the twenty-first century. This new, expanded second edition includes updated examples from the frontlines of social movements and provides the reader with easy-to-use tools to change the stories they care about most. This is the first book-length treatment of the concepts, designs, methods, and tools needed to conduct effective advocacy and policy change evaluations. The authors draw on over 30 years of evaluation experience; collective wisdom based on a new, large-scale survey of evaluators in the field; and in-depth case studies on diverse issues-from the environment, to public health, to human rights. Ideal for evaluators, change makers, and funders, this book is the definitive guide to advocacy and policy change evaluation. “Providing a theory of social change that is convincing is already a tall order, but Duncan Green sets himself an even higher bar. The book aims to be a practical field guide to social activism. More than that, it aspires to be a field guide not just for the kinds of people he normally works with, such as NGO campaigners or grassroots organ- izers. 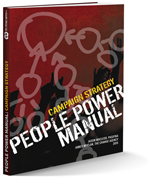 It is meant to be a field manual for activists in the broadest sense: politicians, civil servants, businesspeople, even academics.” [Ha-Joon Chang, Foreword] Download the pdf for free by clicking on the ‘open access’ link.